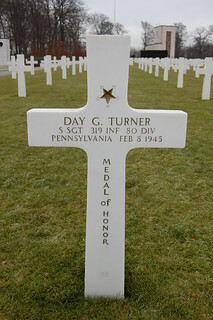 Medal of Honor citation: Sergeant, U.S. Army, Company B, 319th Infantry, 80th Infantry Division. Place and date: At Dahl, Luxembourg, 8 January 1945. Entered service at. Nescopek, Pa. Birth: Berwick, Pa. G.O. No. : 49, 28 June 1945. Citation: He commanded a 9-man squad with the mission of holding a critical flank position. When overwhelming numbers of the enemy attacked under cover of withering artillery, mortar, and rocket fire, he withdrew his squad into a nearby house, determined to defend it to the last man. The enemy attacked again and again and were repulsed with heavy losses. Supported by direct tank fire, they finally gained entrance, but the intrepid sergeant refused to surrender although 5 of his men were wounded and 1 was killed. He boldly flung a can of flaming oil at the first wave of attackers, dispersing them, and fought doggedly from room to room, closing with the enemy in fierce hand-to-hand encounters. He hurled handgrenade for handgrenade, bayoneted 2 fanatical Germans who rushed a doorway he was defending and fought on with the enemy's weapons when his own ammunition was expended. The savage fight raged for 4 hours, and finally, when only 3 men of the defending squad were left unwounded, the enemy surrendered. Twenty-five prisoners were taken, 11 enemy dead and a great number of wounded were counted. Sgt. Turner's valiant stand will live on as a constant inspiration to his comrades His heroic, inspiring leadership, his determination and courageous devotion to duty exemplify the highest tradition of the military service.